It's August, and I am definitely in full swing Halloween mode! My collection of one of a kind folk art characters is slowly building as I anticipate a large shipment of my licensed Halloween collectibles to soon arrive. So, I will be sculpting and painting originals while unpacking and signing my reproductions. 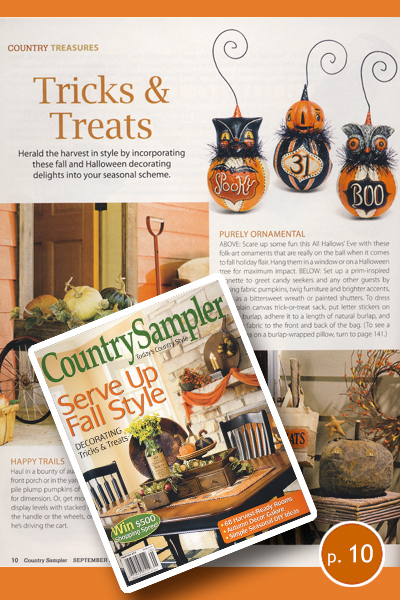 And here's some fun news… My Halloween ball ornament trio that I designed for Bethany Lowe's 2014 season are featured right now in the September issue of Country Sampler Magazine! Turn to page 10 to see these fun characters, and email me if you are interested in adopting a set. I will be signing and shipping these pieces, and please note that quantities are limited. I hope to bring a few sets with me to this year's 9th Annual Halloween Trunk Show here in Denver too. * Here's a close up teaser of these delightful ornaments. For more details you can visit my Folk Art Reproductions page. 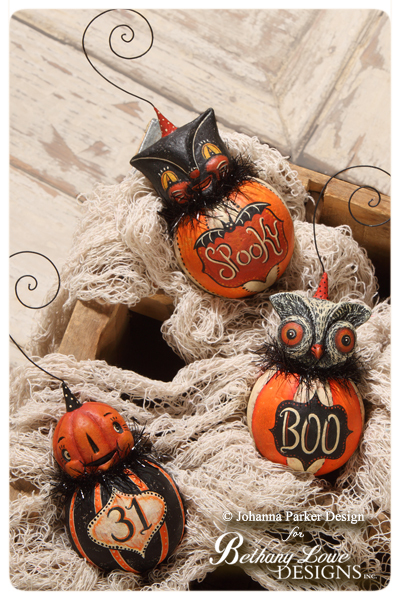 * And, a peek at the Country Treasures section of Country Sampler Magazine reveals these jovial characters!